Bill & Lisa's Sporting Life: MATT WENNING- World Ranked Powerlifter and our Trainer! 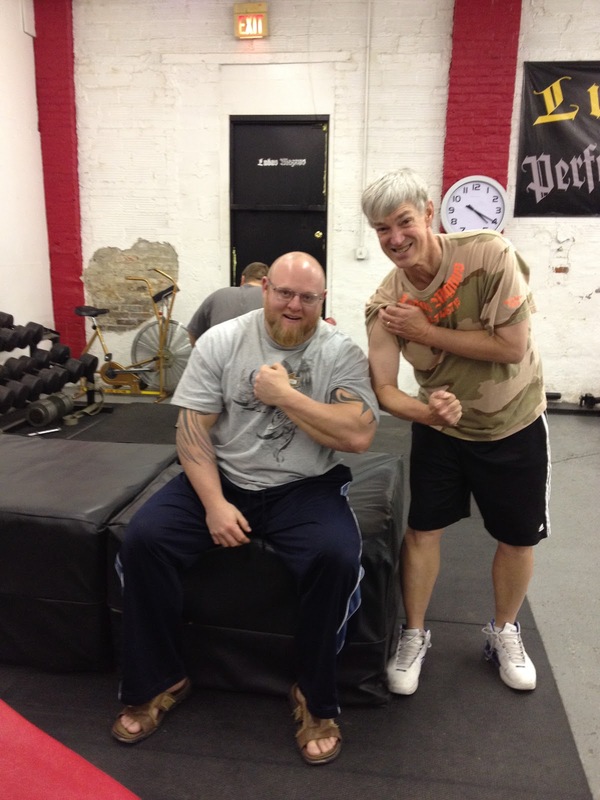 MATT WENNING- World Ranked Powerlifter and our Trainer! Some folks truly enjoy working out. But most of us eye a training regimen with varying degrees of dread. Regretably, I fall into the latter category. Lisa has a better attitude, but she certainly falls far short of gung ho! Nevertheless, both of us have kept a consistent twice-a-week schedule of weight training for over four years. The reason: our remarkable trainer- 33 year old powerlifter Matt Wenning! He tips the scales at 300 pounds of massive muscle with no discernible fat. Touch his arm, and you sense that he is composed entirely of granite. And Matt is a major figure in the "under the radar" sport of powerlifting- a most demanding form of weightlifting competition in which the lifter seeks to attain the highest combined squat, bench press, and dead lifts. 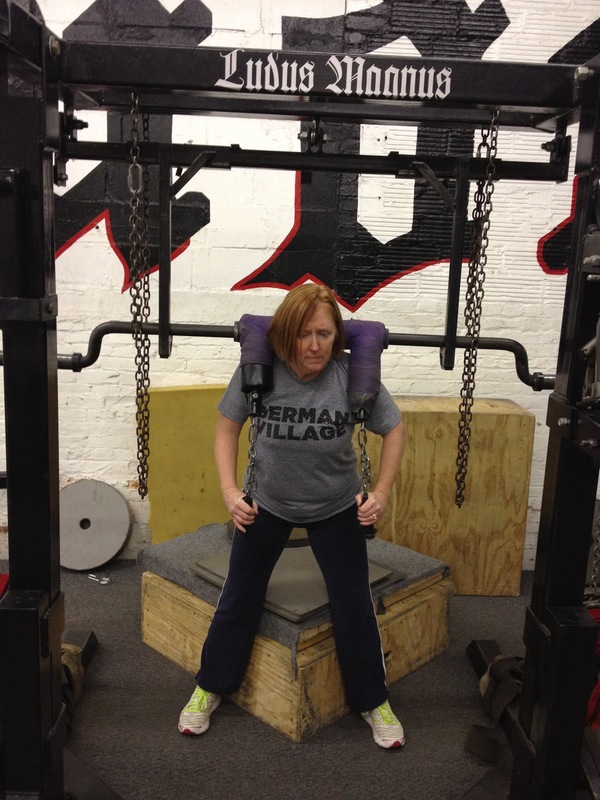 Until recently, Matt held the American record for the heaviest squat- 1197 pounds! He is still a force to be reckoned with in the 308 pound class. Search his name on You Tube, and you can watch several of his milestone lifts. But a trainer's sparkling credentials alone would not have been sufficient to overcome our hardened resistance to long-term training. What is it about Matt and his coaching that has enabled Lisa and me to stick with it? First, he knows what he is doing. Matt has made a lifetime study of how to make a body stronger. His masters degree in Biomechanics from Ball State speaks to that. He focuses on a trainee's weak spots. Before I started my training, I was plagued with back pain, and my balance was poor for someone who always aspired to be an athlete. 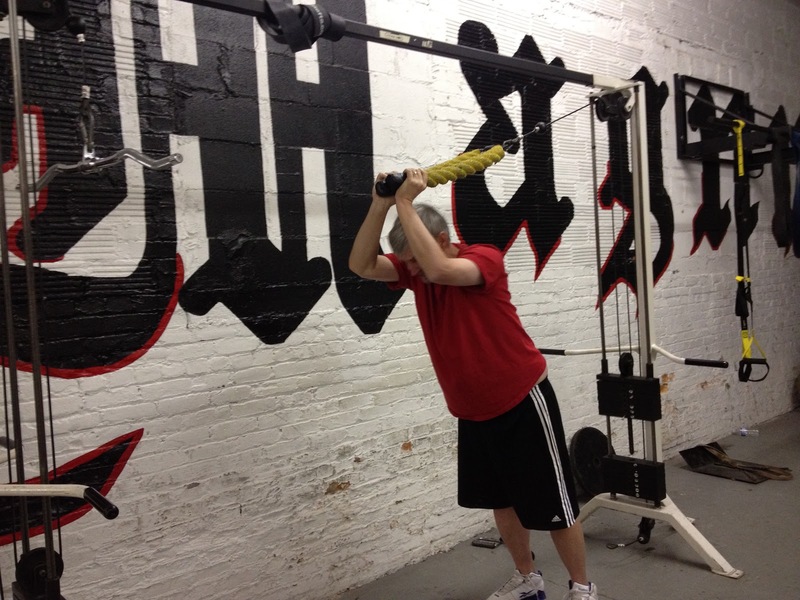 Matt devised unique lifting and training techniques to attack these deficiencies. As a result, I have been pain-free for years, and my balance is much improved. 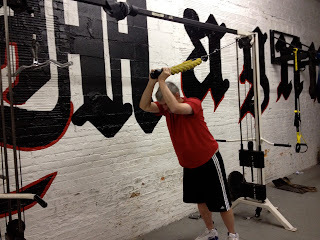 Second, Matt introduced us to several eastern European and other novel training methods that made our work outs anything but routine. You might see us pulling weighted sleds on the sidewalk outside Matt's "Ludus Magnus" gym on West Rich Street in Columbus's near west side. 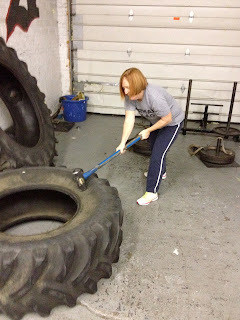 Another routine has us pounding a sledgehammer into an industrial tire. 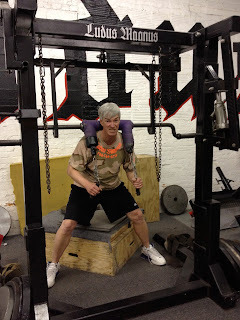 How about bench-pressing with large chains attached to each end of a barbell instead of weights (helps with balance)? Third, Matt is a great communicator, and somehow he has figured ways to make our hard work fun. While hard-nosed about getting the most out of us, and generally unsympathetic to whining, he nevertheless is good-natured and flashes quick-witted , though often politically incorrect, humor when we are flagging. It is then when Matt launches into his Arnold Schwarznegger impression imploring, "Come on, girly-man, do it or I will put you in the hurt locker!" He works us at a brisk pace and stretches our limits, but not for too long. Our typical workout lasts about 35-40 minutes. Finally, there is something about the no-frills Ludus Magnus gym itself (the name comes from the place where the gladiators trained before entering the Colosseum to do battle) that we find appealing. The entire focus of the place is training. No one pays attention to the peeling paint in the austere old warehouse or to the lack of amenities. The ambience calls to mind the starkness of Rocky's Russian training venue in "Rocky IV" (although Mr . Wenning has not yet made us chase chickens as did Sly Stallone's movie character). 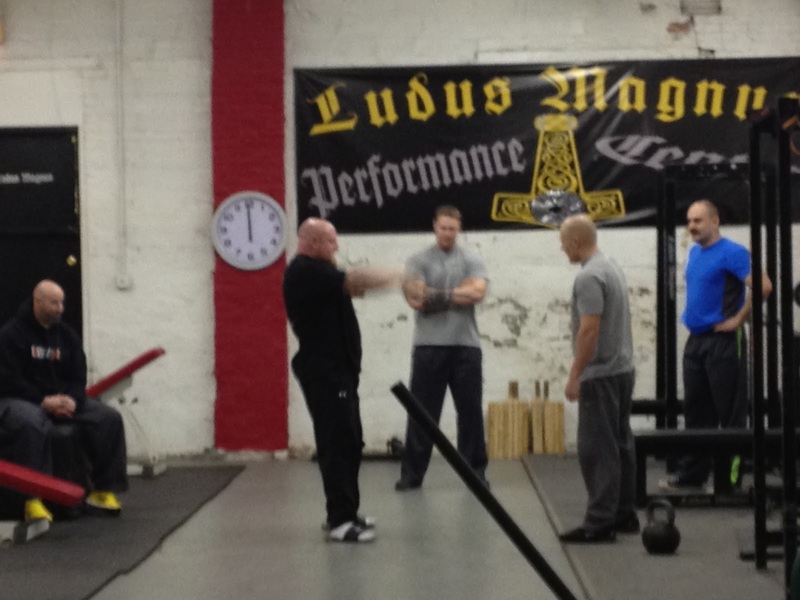 Ludus Magnus carries an authenticity which luxurious athletic clubs cannot hope to match. An interesting mix of people train at Ludus Magnus. You will encounter super-strong power lifters, including Matt's fellow trainer Christian Mello. Most of the serious lifters sport facial hair, but precious little on their respective heads. MMA fighters are on hand as well. 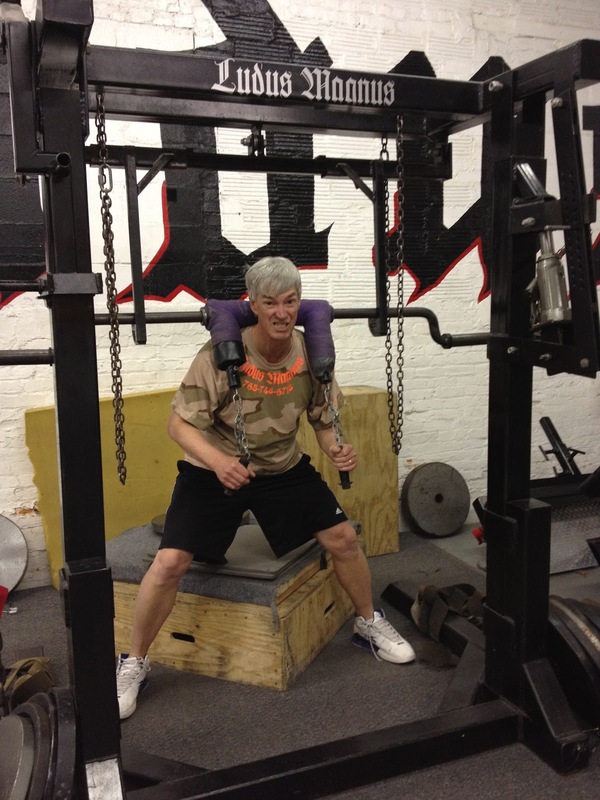 Several female fitness competitors hone their bodies under Matt's tutelage. Firefighters, cops, housewives, high school athletes, and retirees sweat away. Even NFL players and old OSU coach Earle Bruce have responded to Matt's exhortations. 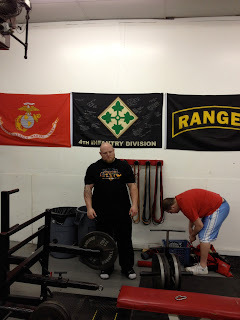 The only adornments on the walls of Ludus Magnus are several military units' flags signed by grateful soldiers whom Matt trained pursuant to six figure contracts with the U.S. Army. How did this young trainer, relatively unknown outside the powerlifting community, manage to land these mega-deals? He did his homework and capitalized on some good fortune. Matt made a study of military methods, and concluded that there was far too much emphasis on building stamina (forced marches etc,) rather than strength. Making the most of an unexpected audience in front of an army general, Matt persuaded the top brass that today's soldier is often engaged in house-to-house guerrilla warfare requiring explosive strength (knocking down doors etc.) which Matt specializes in providing. His ability to communicate his ideas resulted in the general's recommendation to contract with Matt. After Matt's methods were adopted by the units he trained, their levels of injuries and casualties dropped significantly. Matt is an interesting character who is full of surprises. Best example: He took his over 70-grandmother on a cross-country motorcycle excursion last summer. Yes, Matt definitely makes our lives more interesting and fun- not to mention healthier!